Wort being boiled in a modified (legally obtained) Sanke keg. We all know that water boils at 212 °F (100 °C). Chemists would clarify that this refers to pure water at standard pressure (100 kPa). Many brewers assume, given that wort is mostly water, that it also boils at 212 °F (100 °C). This isn’t the case, however. 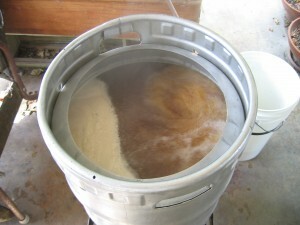 Wort boils above 212 °F (100 °C) — the exact temperature depends on the gravity of the wort. This article has quite a bit of chemistry in it. Don’t feel like you need to follow every little bit. I’ll explain the take home message in the concluding paragraphs.